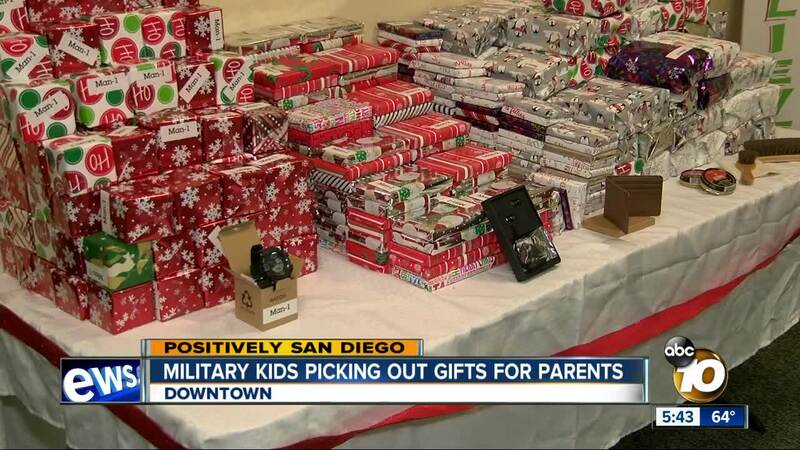 SAN DIEGO (KGTV) — USO San Diego's annual "Santa Store" event kicks off with a special event Tuesday night at their downtown office. The event allows children of military service members to pick a free present they can give their parents as a holiday gift. "It just helps give a little more holiday cheer for our service members who do so much to keep us safe and secure at home," USO San Diego CEO Lorin Stewart told 10News. Volunteers collected and wrapped thousands of presents, including watches, tool kits, headphones, makeup kits, and handbags. The parents stay outside the Santa while USO San Diego volunteers help the children select the right gift. "They love being able to talk about what mom and dad are into and what they like, and then have that surprise under the tree," said military spouse Ashley Camak, who organizes the annual event. "Just makes it a magical moment for them." The evening also includes a meal, play area, and chance to take a picture with Santa. The "Santa Store" will be open December 4-6 from 5-8pm.